One of my favorite features in the dining room is a pair of gorgeous shagreen cabinets with chunky turquoise pottery lamps and elegant accessories arranged on top. The circular Venetian mirrors are a pretty touch too! 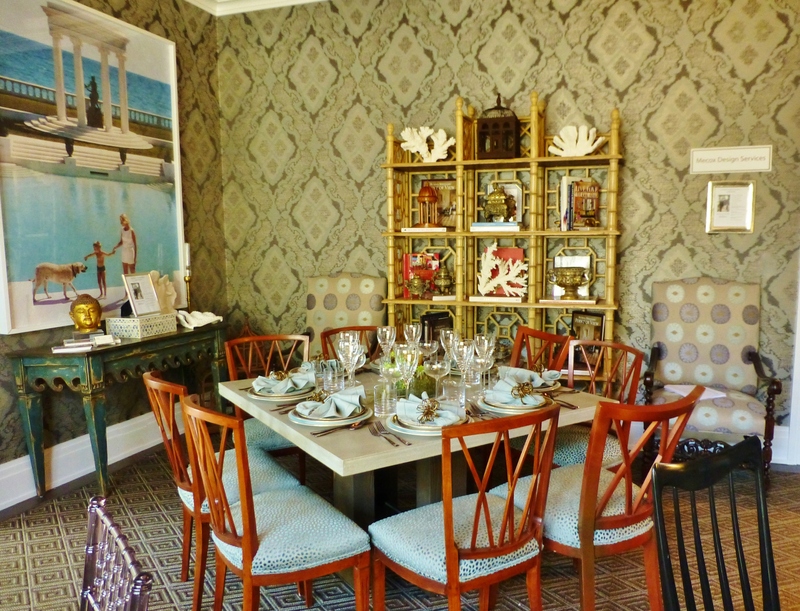 Welcome back to my little tour of the 2014 Hampton Designer Showhouse. This is one of the most respected showhouses in the United States with rooms created by many A-list designers. I’ll be featuring photographs I took during my own visit to this impressive mansion located at 408 Pauls Lane in Bridgehampton, New York. The stunning shingle style house has many eaves and a lovely front porch. 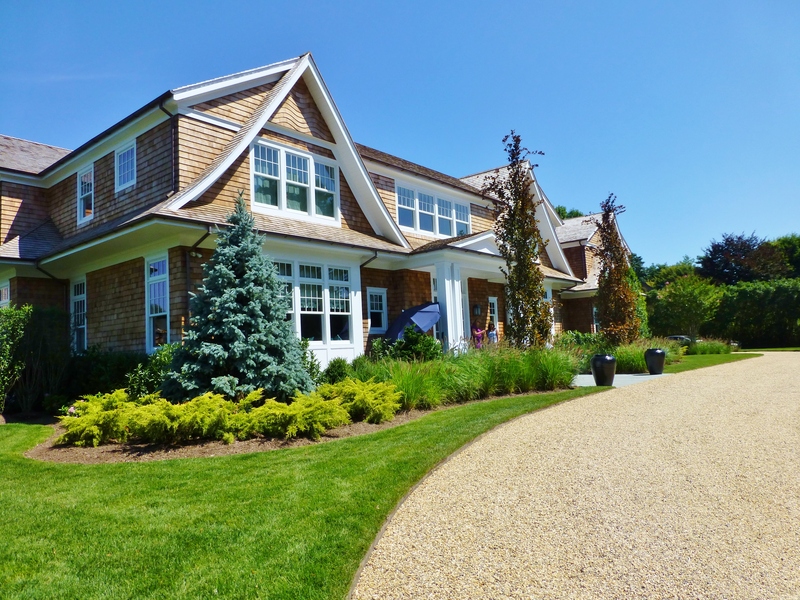 The gravel drive is typical in the Hamptons…I think it lends a vintage appeal, don’t you? 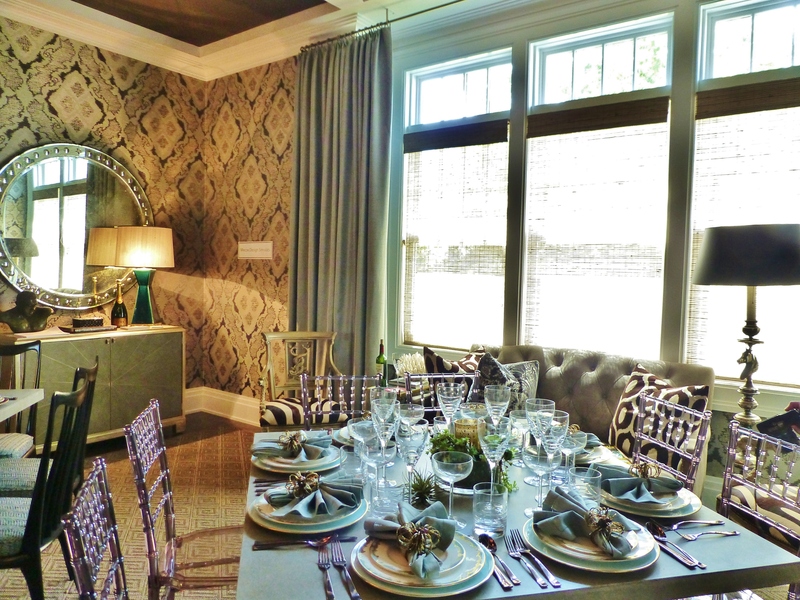 The dining room at the 2014 Hampton Designer Showhouse was designed by Mecox Design Services. It has a moody neutral brown and grey color palette, driven by the large ikat patterned wallpaper. There is also a built-in wine closet in the dining room–located straight ahead behind the class enclosure. The room is laid out very symmetrically, seen above as entered from the foyer. The kitchen is accessed through the swinging door to your left in the image above. 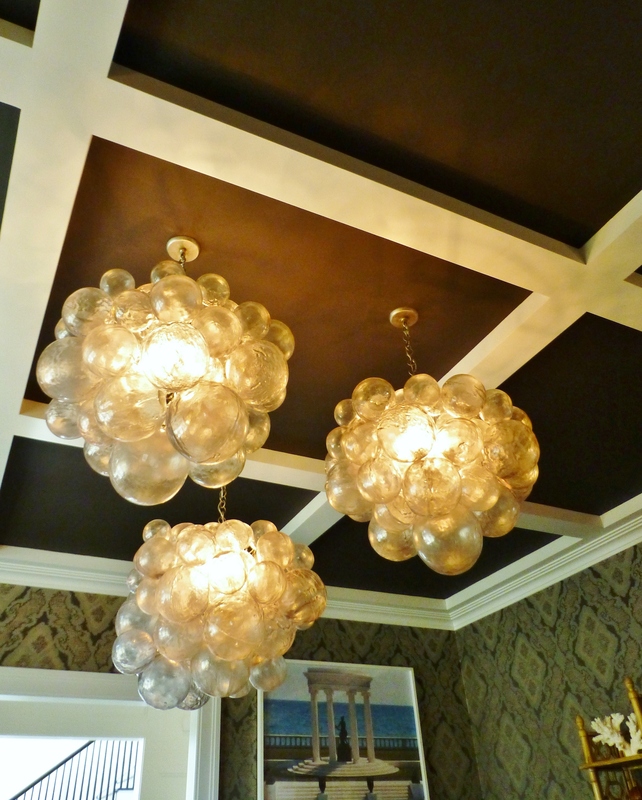 This cluster of three large bubble-like chandeliers draws your eye to the dramatically dark-painted coffered ceiling. Rather than use a single large dining table, the Mecox designers chose to use 3 separate square dining tables, with a different chair style at each. The chairs vary in shape, color and line. Even the seat upholstery varies between each table. You should notice additional upholstered seating is also provided in this dining room, like the tufted settee and zebra hide chairs in front of the large front windows. The opposite side of the room features a bamboo étagère, flanked with a pair of large arm-chairs upholstered in a round medallion fabric. Notice the extra large framed photography (one of a pair) seen above the distressed painted console at the left. This room features a widely eclectic mix of furnishings and LOTS of pattern! 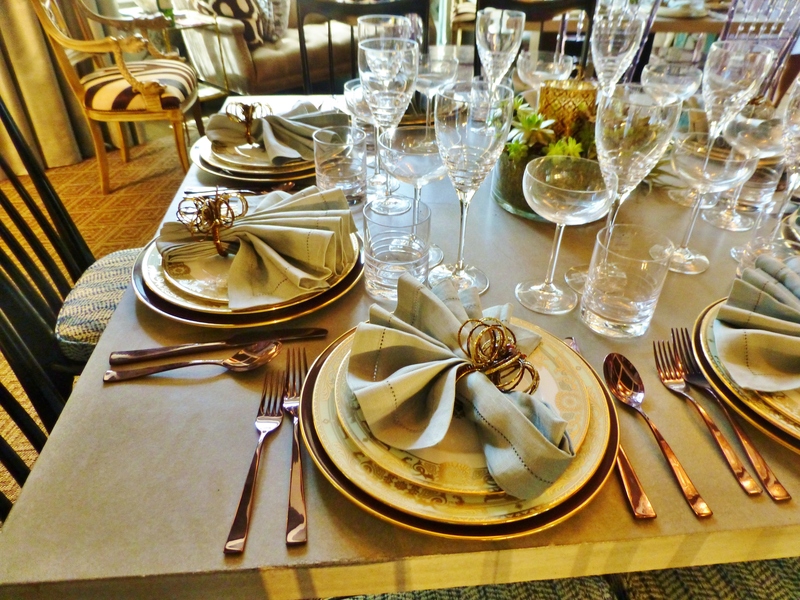 Three square tables are set beautifully with formal gilded place settings and a mix of lovely crystal glasses. 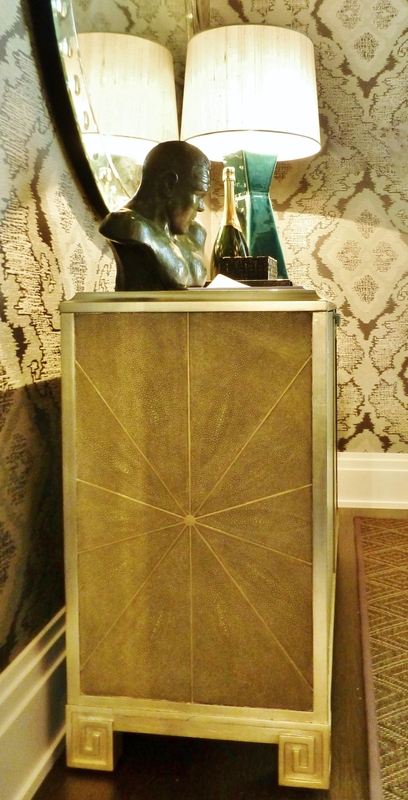 The designers chose to use a mix of warm metallic finishes: gold, rose gold and bronze. Each table is set for eight people. One of my favorite features in the dining room is a pair of gorgeous shagreen cabinets with chunky turquoise pottery lamps and elegant accessories arranged on top. The circular Venetian mirrors are a pretty touch too, don’t you think? 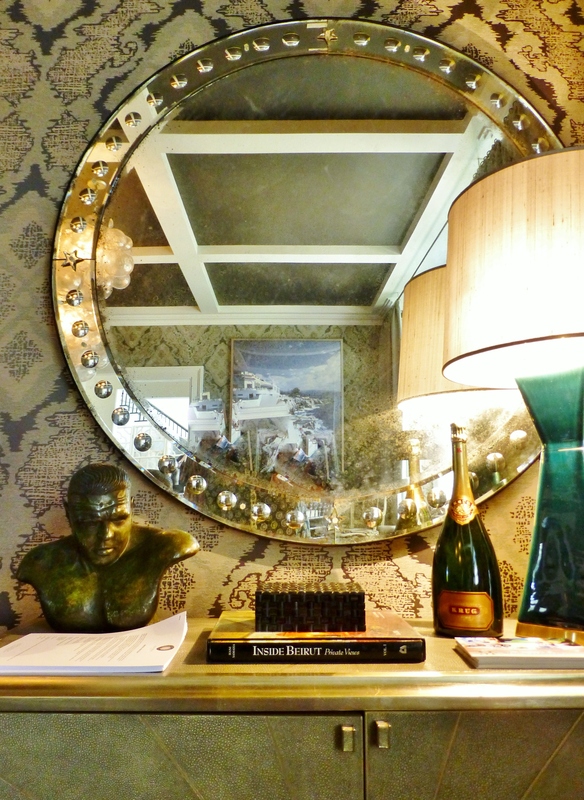 This shagreen cabinet is one of a pair that flanks the glassed-in wine enclosure. Shagreen is a luxurious material commonly made from the skins of sharks and rays. It’s often used to cover books and boxes…even the hilts of swords. Shagreen is NOT often used to cover an entire piece of furniture, like this one, because it is a very expensive substance. The overall design of these chests is especially pretty, with the starburst pattern on the sides and doors, along with silver-leafed details, including the Greek Key feet. 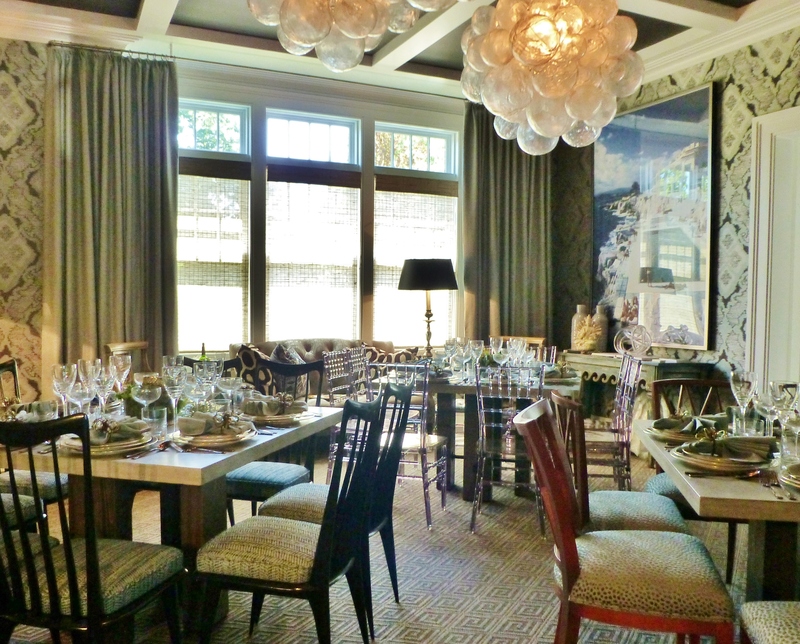 The windows of the 2014 Hampton Designer House dining room are treated to simple full-length grey silk draperies with woven wood shades beneath. The solid color silk is a needed respite from the busy pattern in the wallpaper. In this photo, the different styles of dining chairs at the 3 separate tables is also more apparent. 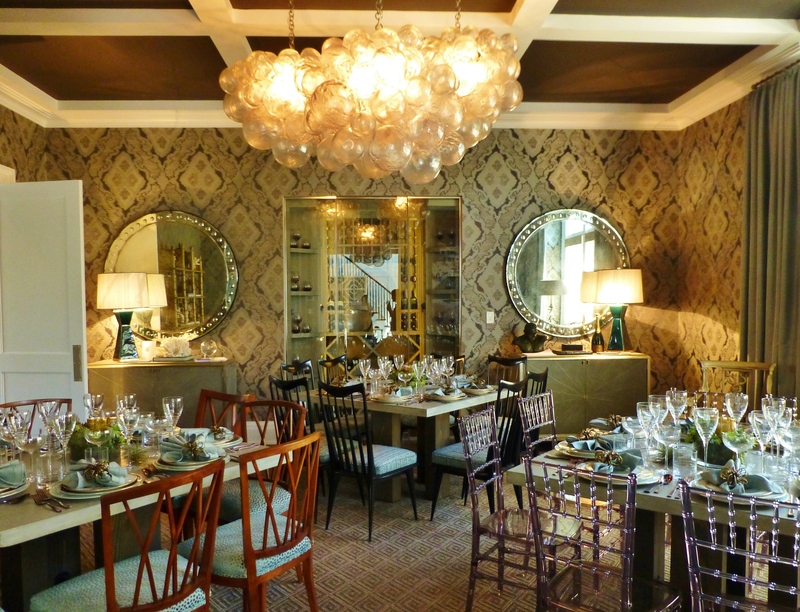 So, what did you think of this exotic dining room with its eclectic mix? There is a lot I like about this room, and there are many things I’d probably not choose to do myself. I DO applaud the design team for using innovative ideas (like an integrated wine cellar, multiple tables, comfy seating in addition to the dining table chairs, and three chandeliers instead of the usual single fixture). I’d like to hear your opinions too, so please post your comments when you get a chance! And don’t forget to share my blog with everyone you know…I need all the friends I can get! This entry was posted in Designer House, Designers, Interior Design & Decorating, Mansion, The Hamptons and tagged 2014 Hampton Designer Showhouse, accessories, artwork, Dining, Dining Chairs, Dining Room, Draperies, Furniture, Home, Robinson interiors, Table, Wallpaper. Bookmark the permalink.